25-Nov-2014 -- “Governed from it’s large modern capital city of Bahir Dar on the southern tip of Lake Tana, Amhara covers an area of 170,752 km² and supports a population estimated at 18.5 million in 2011. Although the substantial cities of Bahir Dar, Gondar, and Dessie all lie within Amhara, roughly 90% of the regional population is rural. Orthodox Christians outnumber Muslims by a ratio of 4:1” (Bradt, Ethiopia, edition 6). This year we wanted to visit one of the two highest confluence points in Africa, 11N 39E, which is located in Amhara, Ethiopia. This meant a big deal for us, because last year during a tourist visit of Ethiopia we were already in the area. We called it a “reconnaissance trip” when we got home, but the truth is we utterly and hopelessly failed to reach the point due to lack of time and altitude sickness. But our love of Ethiopia was kindled. So this year we went to Ethiopia for “11N 39E or bust”. Turkish Airlines took us from Amsterdam to Addis Abeba, via Istanbul. On 22 November we landed at 1:15 A.M. Before we could enter Addis we had an Ebola check. Outside the airport a driver from Ethiopian Impressions was waiting for us. He took us to Green Valley Hotel. The next day we wanted to relax and get used to the high altitude. We visited the excellent National Museum where we met our 3.2 million year old ancestor ‘Lucy’. And we drove up Entoto Hill to the (kind of disappointing) palace of king Menelik II, with a beautiful view of Addis Abeba. According to Google Earth the confluence point is located near a town called “Dadula”. So we drove out of Addis on Highway 1 to Dessie and stayed at the Lalibela hotel. The next morning we went to Akesta and drove into the mountains in the direction of Dadula. But no matter how close we came to Dadula, when we asked for directions nobody appeared to know the place. To us, Dadula grew into a mystical, unreachable place. We got a lot of laughs from our guide and driver. Finally, we arrived at the village we had seen on the satellite pictures. It was called “Ewa” (pronounced as “Oowah!”). We could place our tents on the ground of a local “pub” (altitude: 3000 meter). Ewa is quite a large village and the people are very friendly. Our guide “Anteneh” arranged a meeting with the village leaders and explained the project. It was decided to take two donkeys for our camping gear, a horse for emergencies, and two policemen carrying kalashnikovs. Just in case. It all seemed a bit over the top, as we guessed we only needed one day to reach the point and go back, but we were a happy procession trodding through the mountainous countryside of Amhara. At 8:30 AM we left the village. Our driver “Gabru” took us to a point where we started the walk. It was a walk of about 17-18 km to the point and back. The surroundings where beautiful. Around eleven we already reached the point and were very happy. 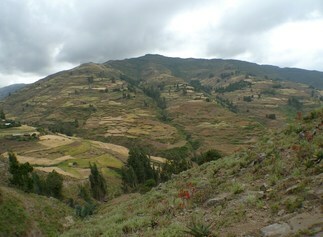 The point was located at 3066 metres altitude, which makes it THE highest Confluence in Africa. The guide, policemen, and donkey driver were also impressed by the occasion, and posed solemnly for a photo to be hung at the police station. On the way back we sometimes took turns on the horse’s back, for a genuine Indiana Jones feeling. Back in the village a lamb was bought to celebrate. It was meticulously slaughtered and roasted with the fresh thyme we had picked during the walk, and shared with the people in the village who had helped and accompanied us. It was a great adventure. Time start walking: 08:30 a.m. Arrival at CP 100 meter zone: 11:15 a.m. Interesting facts/experiences: Problems starting the car. Afterwards we ate sheepmeat. This is the highest Confluence in the African continent. It is only a couple of metres higher than 29S 29E in Lesotho.